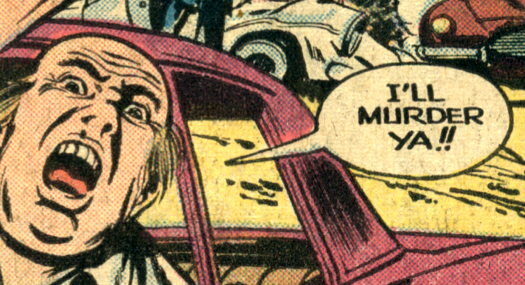 And now, my favorite character from the near-conclusion of a comic book car chase. This artist sought the perfect depiction of “dude inconvenienced by the regular goings-on of the star of the comic book” and he achieved it. What is this guy’s story? Where did he come from? Where was he headed? How did the actions of the main characters prevent him from achieving his goals? Why is he so quick to the threat of violence? Alas, with no Atlas/Seaboard equivalent of Astro City to follow the lives of these incidental supporting figures, we may never know. i love all atlas comics!!! Please post something from tarantula – the art on that was my favourite of the lot! “This artist” is credited as Big Mike Sekowsky, one of my all-time faves. Al McWilliams’s inking sure overrides his style but cannot restrain his energy. I detect a distinct resemblance (before his hair went white, but with the same baldness pattern)to Marvel’s Red Ghost. 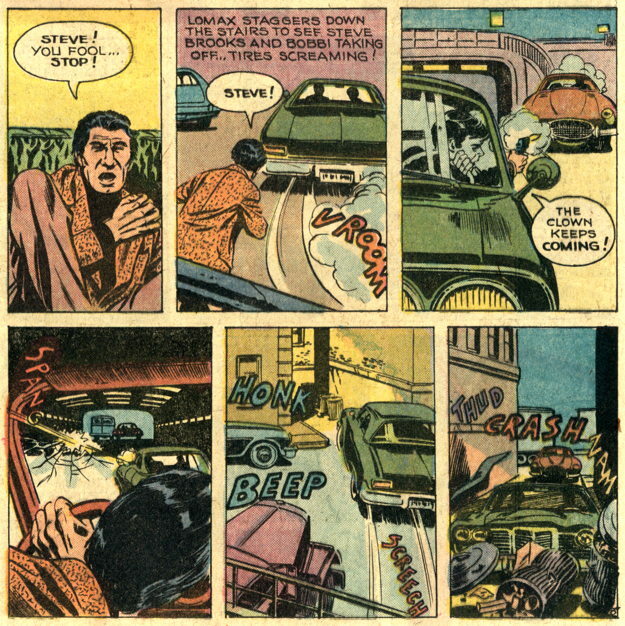 Note that the guy’s trunk is open in the penultimate panel, but closed in the final shot. I think this is the Red Ghost, early in life, in civilian garb, with some of his super-apes in the trunk, who have secured the lid once it popped open. Police comics were the one genre that Atlas tried that was not a carbon copy of what Marvel was already doing. And it was a good call, as police dramas were becoming popular on TV at the time. But we’ll never know if they were right, since nothing lasted long enough at Atlas to determine if it had decent sales or not. the first issue of Targitt is one of my favorite Atlas books (the second one, not so much). Why does he wave his right arm out the window? The left arm would be so much more convenient. Roel, he had to roll down the window with the left. The ’70s were very inconvenient. If ever there was an occasion to add the “AND THEN…KOREA” panel, it was this.